Kavieng offers truly spectacular holiday experiences – both on and off the water – and Scuba Ventures Kavieng offers every resource to make your holiday as memorable as possible. We know that getting to Papua New Guinea to dive isn’t the easiest thing in the world, so we’ll always go that extra mile to make sure that when you come to Kavieng, you have the holiday of a life time, whether you dive PNG or not! As you’ll see from the rest of the web site, the diving opportunities are legendary, both in their scope, impact and variety. You’ll find a range of scuba adventures unlike anything else. From swimming with great schools of barracuda and pelagics on the walls that border the Bismarck Sea, exploring a mysterious fresh water cave system or uncovering a long forgotten shipwreck, you’ll find a range of underwater activities that are unique to this area. But visiting Kavieng is about much more than diving. At Scuba Ventures Kavieng, we want to make your experiences memorable – both on and off the water. So we will always go that extra mile to help you experience Kavieng. With us focused on delivering your best experience above and below the water, you really will be in best hands for all facets of your holiday in Kavieng. Dorian and Cara are fully accredited NAUI and PADI instructors, with many hours experience diving in all conditions. They bring their guests a combined 30 years experience in the business of diving in the tropical waters of Solomon Islands, Mozambique, Comores and South Africa. Dorian has been working on the water since the age of sixteen, where in between working as a lifesaver at the local beach and catching as many waves on his surfboard as he could, he also operated his own boat hire and fishing charter business. He started diving in 1985 and became an accredited instructor in 1990. Since then he has introduced thousands of peoples to the underwater world, working and diving all over the world. An accomplished underwater photographer, he has been shooting since 1992. After several years working and diving together in the Solomon Islands, Dorian and Cara moved to Kavieng in 2000, lured by tales of an unspoiled ocean paradise. They discovered an untapped wealth of dive sites, located in one of the most beautiful towns in the Pacific. In the years since then, Dorian has explored the surrounding waters, discovering many of the dive sites that you will have the opportunity to experience. Cara learnt to recreational dive during her five years working on an oil rig off the South African coast, where she put her degree in Fine Arts and Environmental Science to good use. As diving was one of the favourite hobbies of the riggers, she soon racked up many hours diving, and was one of the first young South Africans to take the PADI Instructors certification in South Africa. Pretty soon she had left the cold rigs of the Atlantic behind and was managing a dive center in a Mozambique resort, where she met Dorian. They soon moved to the Solomons, and eventually ended up setting up their own operation in Kavieng. 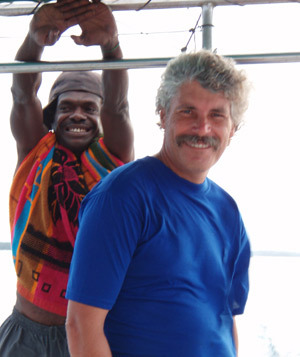 Robert has been working with Scuba Ventures since year 2000 as a boat driver and guide. Robert is mixed parentage from New Hanover and Mussau, his family lives at Taskul. 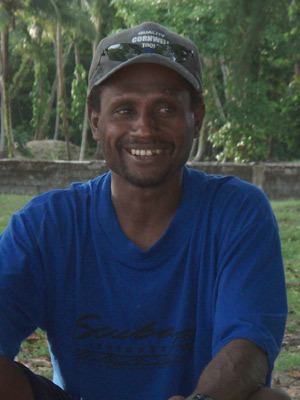 With many hours experience driving boats, Robert is one of safest boat handlers in Kavieng. Apu is a trusty boat assistant and handler also from New Hanover. 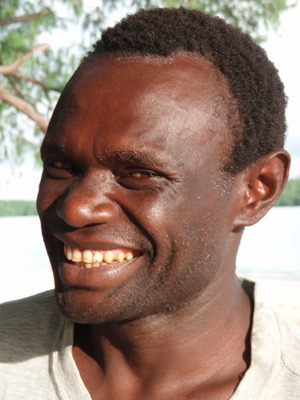 He really enjoys showing snorkellers around the reefs and is always ready to give a helping hand on the boat.